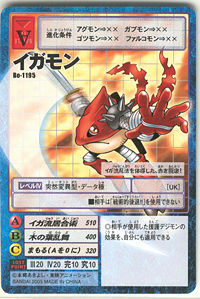 A mysterious Digimon wearing a red mask. It is wandering the Digital World and building its training. It is a master of espionage, and if it is hiding within the trees of a forest, or hiding underwater, catching sight of its figure is considerably difficult. 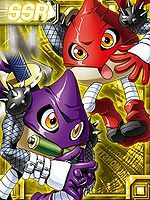 Also, although it differs in school and doctrine from Revolmon, who is also one of the "Virus Busters", they are comrades in arms since olden times, and are also good rivals. 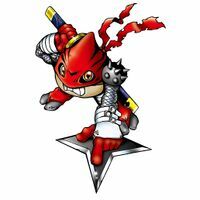 Its Special Move is using a gigantic shuriken (Iga-ryū Shuriken Nage). — Digimon Adventure 02: "Shurimon's Martial Arts"
— Digimon Savers: "Imprisoned Masaru, The Holy Capital´s Trap"
n., Originates from Iga-ryū 「伊賀流（イガリュウ）」, a type of martial arts developed in the Iga Province, associated with ninjas. 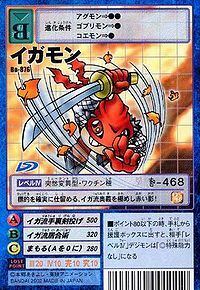 Anime/Manga Digimon Adventure 02: "Shurimon's Martial Arts"
Iga-ryū Shuriken Nage  Iga-style Shuriken Throw イガ流手裏剣投げ N/A Iga School Knife Throw/Ninja Knife Throwing/Ninja Knife Throw/Ninja Star Burst Throws one or more large shuriken at the enemy. Iga-ryū Iaijutsu  Iga-style Sword Draw Skill イガ流居合術 N/A Ninja Jujitsu Attacks with a sword-draw skill faster than the eye can see. Temporarily creates up to eleven clones of itself. 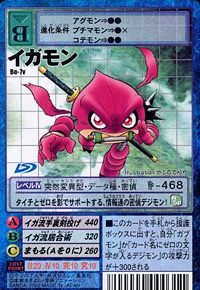 Konoha Ranbu  Dancing Leaves 木の葉乱舞 N/A Dancing Leaves/Ninja Hopping Spins around and creates a tornado of leaves that surrounds the foe. Empowers its sword with Gabumon's Petit Fire to unleash a fiery slash. Uses a smoke bomb to conceal its escape. An Igamon was a victim of the Evil Ring and fought Shurimon. An Igamon was seen at the Akiba Market. Many Igamon came to the aid of the Holy Capital on El Doradimon's back. A slightly different colored Igamon was sent by Lord Holy Angemon to help Taichi and Zeromaru. Igamon appears as an obtainable Adult-level Data type Digimon in Digimon World. 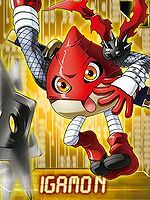 Once you have recruited at least one of the 4 Secret Item Shop Digimon, which are Numemon, Mojyamon, Mamemon and Devimon, an Igamon will appear in the Digi-Bridge and jump at you, demanding for a battle. After it has been defeated, it will offer to be your discipule and to do it, it ends up joining the Village of Beginnings in the Secret Item Shop providing useful information about the many 128 types of items in the game. Bonus conditions: Battle more than 15 times and have at least 35 different techniques mastered. Igamon's evolution item are the Koga's Laws which lets any Child Digimon evolve into Igamon. Sukamon (When its Poop Gauge is full). Igamon tosses two shurikens that slash the enemy and explode. 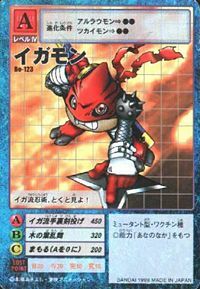 Igamon is an obtainable Digimon. 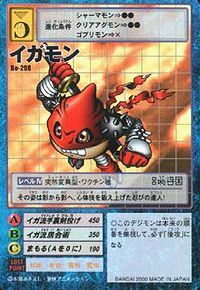 Evolves from Patamon (0-2 DP) and can evolve to Mamemon (0+ DP). 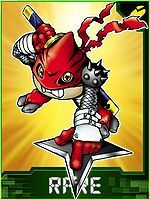 Igamon is available as a Digimon Medal. 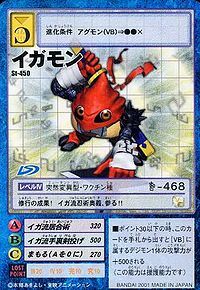 Igamon is available as a Digimon Card. Evolves from Gabumon or Plotmon. 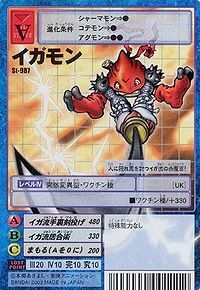 Can evolve to Were Garurumon or be Jogressed with a compatible Digimon to get Asuramon, Metal Mamemon or Angewomon. These are the results of its training! Behold the ultimate techniques of Iga-style ninjutsu!! A red shadow versed in Iga-style, it hides among people and strikes at evil! Witness carefully my Iga-style ninjutsu! Moving from shadow to shadow, this expert ninja has trained its spirit, body, and skills well! Having mastered the Iga-style secret arts, this red shadow brings its targets down without fail! This red spy has mastered the Iga-style ninja arts! 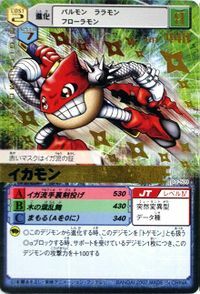 This informant spy Digimon supports Taichi and Zero from the shadows! Its red mask is proof of its Iga-ryū techniques. ↑ Digimon Adventure 02: "Shurimon's Martial Arts"
↑ Digimon Adventure V-Tamer 01: "VS Omegamon ③, The Reason for Fighting"
This page was last modified on 18 March 2019, at 21:48.